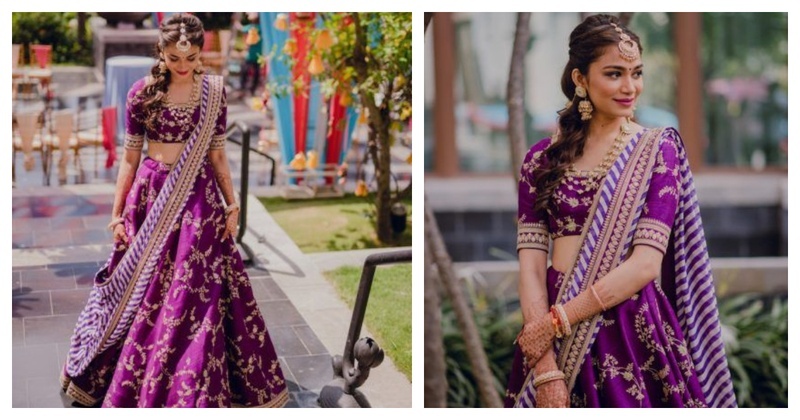 This Chennai bride's purple Sabyasachi lehenga is taking over social media! Chetana - the bride whose purple Sabyasachi lehenga is doing the rounds of Instagram needs no introduction really. And I for one can’t get enough of her bridal outfits! Her wedding is one of the most watched and loved weddings in all the social media combined and the reason being - she is a true fashionista. All the lehengas she has worn for all her events are ah-mazing and believe me when I tell you, they will give you some major #BridalWearGoals. She chose this for her mehendi! How stunning is her purple all purple Sabyasachi lehenga with golden placed motifs on it? What caught my attention the most is the purple and white stripes dupatta on the lehenga. It’s so offbeat, stunning and elegant at the same time! She has completed the look with a statement maang tikka, jhumkas, a long necklace, small bindi and a nice shade of pink on the lips. For her sangeet, she wore an olive green Sulakshana Monga lehenga with golden detailing and looked her most stunning self. She completed the look with half-up braided hair from both sides, white necklace and earring set with pearls in them and a dash of pink on the lips. For taking her pheras, Chetna decided to be the traditional bride in red. She wore an all red Sabyasachi lehenga with golden placed motifs on the lehenga skirt paired with golden floral motifs on the choli. She paired the lehenga with two red dupattas of sheer silhouette. She completed her look with a all-gold statement matha-patti paired with a heavy choker and earring set with emeralds in it. The green sure did bring about the pop-of-colour to the red lehenga and enhanced her bridal look. They make a stunning pair don’t they?